Can I tell you, I’ve just fallen in love with birding all over again. I owe this renewed ardor for avian observation to a magnificent new volume simply called BIRD. If you appreciate truth in advertising in service to an exhaustive, eye-popping review of the world’s abundance of avifauna, you will absolutely love this book. BIRD: The Definitive Visual Guide is aptly titled. First of all, this book is unabashedly about birds. Audubon and DK Publishing, along with BirdLife International and a host of other contributors, have created the consummate birding coffee table book, big and beautiful in equal measures. Although it treats specifically with about 1,200 species, BIRD is as definitive on the topic of Class Aves, from tinamous at the top to the bunting (Painted) at the bottom, as any single volume could be. And is this guide visual? That Blue-footed Booby on the front cover sets the tone for a photographic tour de force so aesthetically pleasing that one might imagine the publishers are trying to sell birds. In a sense, BIRD is all about marketing its striking subject matter. This treatise devotes its first hundred or so pages to ornithological exposition on subjects as varied as anatomy, diet, behavior, and breeding. It then delves into geography and the varied habitats that support bird life. Next comes nearly 400 packed pages of species profiles replete with vital stats, range maps, brief biographies, and miles and miles of dazzling photographs. These images aren’t meant to illustrate key field marks but rather to depict the diversity of avian allurement. Page after page of stunning portraits make BIRD eminently browsable, while random multi-page panoramas like the muted splendor of a fuzzy Spotted Sandpiper chick nestled in dry leaf litter ensure that this a book to come back to again and again. As magnificent as this magnum opus is, it isn’t perfect. For one thing, if your geography isn’t keen, those range maps can be inscrutable. In addition, the authors sometimes fail to adequately identify a species on display; most American readers won’t connect Kentish Plover to the bird known as the Snowy Plover in the States. But my main concerns revolved around the apparent randomness of species selection. The authors achieved the unenviable task of whittling about 10,000 species down to a manageable fraction but it isn’t apparent what criteria they followed. For example, it appears they didn’t choose the most common representatives of each genus or else we’d see Black Phoebe featured therein. They also didn’t succumb to selecting only the most visually impressive species. In fact, there are plentiful examples of bold birds they left out in favor of more drab specimens. Why choose Warbling Vireo in favor of, say, any of the Solitary complex? For that matter, why include a profile of Yellow-throated Vireo on the same page but leave out an image in favor of the aforementioned oppressively drab Warbling Vireo? Numerous examples of questionable choices can be found, like presenting photos of Song Thrush alongside the lookalike Mistle Thrush while only writing about the reputedly striking Japanese Thrush, but all in all, these complaints seem picayune in the face of brilliance. 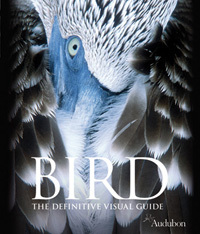 BIRD: The Definitive Visual Guide is an unsurpassed ambassador piece for birdlife around the world. I own more than my fair share of field guides and reference texts and yet, I’m utterly fascinated by this addictive volume. That a person might peruse this kaleidoscope of avian curiosities and not vow there and then to seek out every one in life is beyond my comprehension. It may not be possible. For that reason, I highly recommend BIRD. Leave this tremendous tome out where the non-initiated might spy it and you’re bound to win over a few birding converts. The book contains a bird CD with fascinating bird songs, though I could not find an index of corresponding birds. Most colorful and varied bird book I have so far. Nevermind. The CD index is on page 512. It says right there on the CD.